I am suffering from the downside of crafting hubris – it should surprise no-one but myself to learn that although I am a good knitter and a good cross-stitcher and a fair-to-middling freehand embroiderer … I’m a bottom of the heap beginner quilter. Is a vague interpretation of this week’s star (see it lying there all sweet and innocent and starry – grrr, naughty star). Folks, this one is kicking me in the teeth. I spent ages carefully cutting out each square exactly and turning them into little exact triangles. 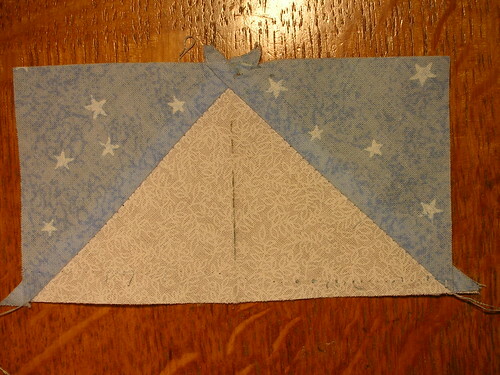 Then the original fabric I cut out for the darker blue looked all wrong so I re cut the blue I am using and in doing so swept half of the pieces onto the floor, including one little blue triangle that was never seen again, so I cut another one of those. See that little dark line? 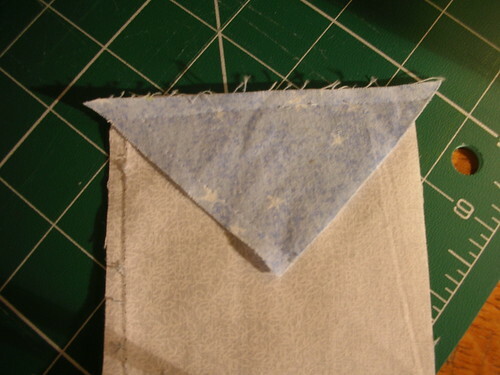 That’s where I melted the thread onto the one triangle that was looking OK – clever eh? 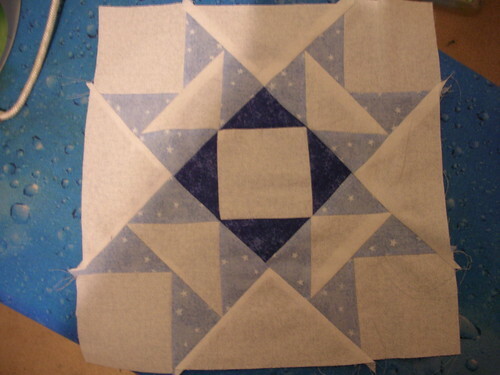 I just can’t seem to make it all line up and the kicker is that this is the only block so far that is smaller than it should be and it’s only going to get smaller the way the triangles are aligned. I solemnly declare here and now that this is NOT going into the final quilt. I can and will do it better. I’m going to reassure myself that today’s disaster is a result of a hot tired little brain that doesn’t like the air pressure. H is away next weekend when I will sit down with next week’s square, this square and a whole load of setting blocks and see what I can make out of it. H came up while I was ripping out another seam and griping at the sewing machine and foolishly wondered why I was doing something I didn’t like – surely it’s obvious that this is my idea of fun! 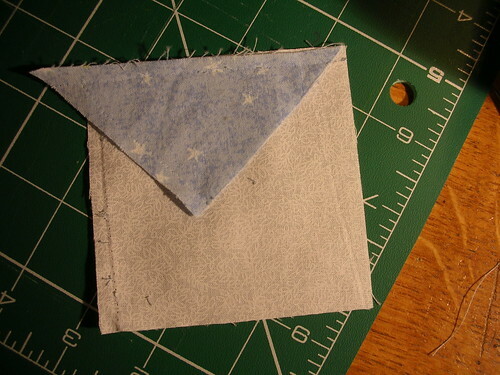 You do it the second way, thereby ending up with a 0.25″ seam allowance at each side. You can buy a little ruler with the edge cut off that means you can cut the corner off the triangle so that it aligns properly with the square. As you are a bright girl you can make one out of cardboard.